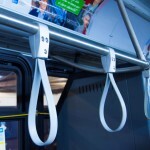 River Drive Manufacturing is pleased to introduce our Docket-90 Passenger Assist Straps. These straps are the first in the market to meet the rigorous DOT/FTA Docket 90-A standards. These straps have been tested by an independent laboratory and have been certified to pass the ASTM E-162 standard for flammability, the ASTM E-662 standard for smoke density and the Bombardier SMP 800-C test for toxicity. The Docket-90 assist straps are available in the standard configuration which includes a chrome-plated die-cast buckle and choice of security machine screw. They are also available with the aluminum rail clamp option. The rail clamp is available is anodized aluminum or yellow powder coated. the rail clamps allow the assist strap to be fixed in place on the overhead rail if desired. We also offer a Docket-90 passenger assist strap with an EPA-registered antimicrobial additive to protect the product if desired.